In this post: Cozy children’s stories to keep you warm through this cold and blustery winter. Stuck. Inside. With Two Screaming Children. All. Day. My kids are just getting old enough to play outside in the snow, but just young enough that they can’t keep their mittens on. Which means snow days for the Little Earthquakes consists of 15 minutes falling down in the snow, screaming for me to help them up, and the rest of the day stuck inside bouncing off the walls, screaming at the top of their lungs. To break up the chaos, here are the books we reserve for snow days. Yes please. I want that. These are the books that capture the excitement and hope of this stage with little kids, the mystery and magic of quiet snowfall, and the grateful feeling I get when I step into a warm house with red cheeks and snowy boots. Captioned age ranges are for when my sons were able to understand and enjoy each story. *Asterisk-marked books normalize kids of color without making the story about race. YAY! My family has unlimited access to a warm, safe home – but many do not. These stories help my boys understand why we support homeless shelters and organizations for refugee relief. ‘The Robot And The Bluebird‘ is a bittersweet story of unrequited kindness. ‘Shelter‘ features feelings of scarcity contrasted with generosity. ‘The Road Home,’ celebrates the journey, even in times of challenge. ‘Ladybug Girl In The Snow’ is a modern tribute to the classic ‘The Snowy Day,’* validating the challenges of being a little kid navigating a snowy landscape. 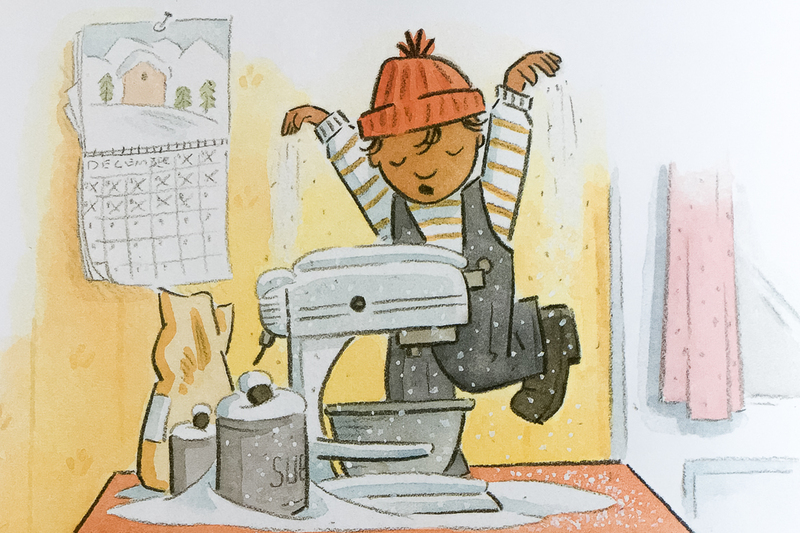 ‘Big Snow‘* (one of my top 10 favorite books) features a little boy much like my spirited son – trying hard to be helpful, but distracted by creativity and daydreaming as he eagerly waits for snowfall. ‘Red Is Best‘ is the official degree of toddlers and preschoolers everywhere – this little girl wants her red boots, her red cup, and her red mittens, practicality be damned. ‘So Much Snow!‘* is a silly, ridiculous romp that will make anyone laugh. ‘The Reader‘ is a slow story of tenacity, grit, and a love of books. While I’m ordinarily pro-library and sharing economy, in the event of being locked into a small house with two rampaging Little Earthquakes, I need support. And since we can’t afford a nanny, I rely on stuff. Huge sofa cushions (aka fort lumber) and loft beds – Forts! Or you can get a kit. We have this one but it’s super hard to connect the pieces. Kids shovels – I’ve found they are less likely to undo all of my hard work shoveling if I hand them their own shovels. This is the one toy I am willing to buy two of, because I just can’t deal with bickering in this weather. Stationary and stamps for writing letters (or craft or baking supplies or whatever) – Don’t misunderstand me – we aren’t mailing any letters. This is just for the kids to throw around the house with glee, believing they are messing up my plans. If you try to use real stamps, the kids will eat them. So maybe use stickers instead, which will end up on your face and destroy your favorite sweaters in the wash.
Quence your children’s urge to smash things / Roll marbles in under the fridge / Feed the heating vent with games – Again, they won’t actually play the games, they’ll just argue over who gets/has to set it up, but during the fistfight you can binge-eat chips in the bathroom. Join our movement in raising kind & brilliant leaders of tomorrow. Click here to get access to exclusive bonus content, sneak peeks, and free resources you can’t find anywhere else.